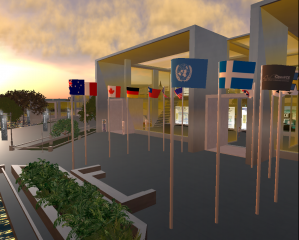 Flags fly over the Central Plaza and Expo area of the Virtual Collaboration Environment (VCE region) in Second Life. Boxes of textures of flags of the world including most national and many regional flags are available to pick up in the Central Plaza. Today I found that the regional flag of Shetland was not in the set. Having spoken to Kevin Moreland, Marketing Officer for Shetland Islands Council, and having had our honeymoon in Shetlands in 1975, I wanted to correct the ommision. Kevin provided full fetails of the flag which uses the Scotttish saltire official blue (Pantone 300) and is based on the shape of the Scandinavian flags specifically those like Finland and Sweden. It is now available in the flag boxes for anyone to use in Second Life and other virtual worlds. These images how the Shetland flag flying over the VCE region in Second Life.